Blogging isn’t easy. But it becomes a tad simpler when you’re using the right tools for the right purpose. Why email your new subscribers manually when you can automate that email (for free)? Why head to social media platforms every hour to post when you can schedule your messages for the whole day – and even a week – in one sitting? The power of good blogging tools is seamless. And if you know which one of them to use and for what purpose, your journey to the top promises to become much more convenient. 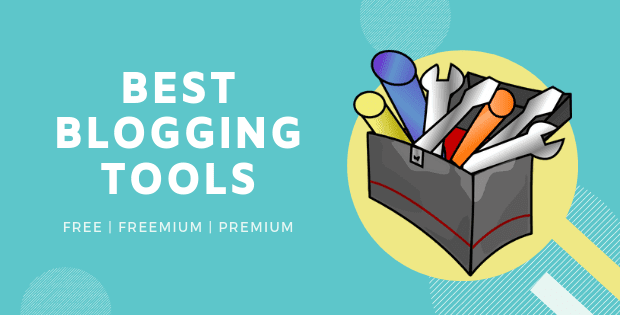 So, here I have compiled a list of some of the most used and completely best blogging tools for beginners and pros. This isn’t an exhaustive list. I have only included those tools that I personally use or are used by those who I trust. Most of these are FREE, some are freemium. For a few, you’ll have to pay; they were too good to skip. There will be times when you’ll run out of ideas. You wouldn’t know what to write about. Even when you want to write on what your target audience wants to read, you wouldn't really know what they "want" in the first place. Note: Some of the following aren’t really ‘tool’. But they are the perfect sources to brainstorm some dope ideas for your next blog post. Just put in 3 keywords (related to your blogging niche/topic, target audience) and it will offer you some very cool ideas to write on. Modify those ideas and come up with something original. Google "*Your Blog Topic* + Quora" (For example, ‘Vegetarian Recipe + Quora’). You will find many user-generated questions. These are likely your target audience looking for solutions. Answer their questions on your blog. Reddit is another MAJOR platform that oozes of user-generated contents. Much like Quora, just Google "*Your Blog Topic* + Reddit". You will find many discussions and problems that will easily rain ideas on you. Just enter a topic or URL and it will give you a list of most shared articles on that topic or in that URL. It’s a very user-friendly and highly resourceful tool. If you already have a sizeable following, why not ask them directly what they want to read? Make a Google Form with relevant questions, spread the link on your social channels and blog, and see what your target audience wants you to write on. Go to Google Trends, click on the 'Explore' tab, and enter your topic(s). Change the demographic, category and duration according to your need. See the ‘Interest over time’ about your topic, as well as Related Topic and Related Queries. Google Trends is also a great tool for quick Keywords Research. You have something very valuable and resourceful to say to your target audience. But if you don’t know how to put that in the right words, it’s useless. Your piece must be grammatically-correct, engaging, easy-to-read, and have definite Call-to-Action (CTA). Sadly, there aren’t many tools to help you in this department. You need to be decent in English—or the native language you’re blogging in. Also Read: Do you need to have strong writing skills for blogging? If you’re bad in grammar (rather like me), this is a savior. Although not as proficient, it easily fixes common grammatical mistakes. Make an account. Then Copy-Paste your article in its Text Editor. And see the magic. I would recommend you install its plugin in your Google Chrome and MS Word. You will not have to visit its website every time. It checks the readability of your article. Go to the website and just paste your article. It will highlight sentences that are too difficult, long and complex to read/understand. Based on how easy or difficult it is, your post will be graded. Another readability checker. The best part is that you can paste the URL of the posts you want to check—no need to paste the entire texts. Ideal to grade the articles you have already published. There are many great online dictionaries. Go for Merriam-Webster for sophisticate-ish definitions, and Wiktionary for user-friendly, user-generated meanings. For thesaurus, nothing beats Thesaurus.com. Don’t use the same words over and over again. Go for their better alternatives to keep the post fresh. For SEO purpose, your headline shouldn’t be more than 65 characters. For high Click-Through-Rate (CTR), your blog post’s title must be unique, attractive and have emotional value. Yes, there’s much more to headlines than what we traditionally believe. The free headline analyzer from CoSchedule will help you come up with striking and high-converting titles. You copy-paste an article here, and the tool simply rephrases it. Many words get replaced by their synonyms. I am not a big fan of this, given it breeds stealing others’ content. But on the other side, it’s ideal for those weak in English who have something important to say/offer but are struggling with sentence formation. Now the main point of this article is really one to few lines at max. The answer could be as simple as “Gain lean muscle by eating beef and brown rice”. But that person can’t really have a post with just a single line. There have to be some fluffs. So she/he can check others’ posts, mix-match things, use such tools and form a decent-sized blog post. I know, copying someone else's work cannot be justified. So unless very necessary, avoid using these tools. Plagiarism is bad. Search Engine Optimization is a fuel to boost blog traffic. Given its wide scope, there are countless SEO tools available—for link building, keyword research, on-page content optimization and more. I am a firm believer that if you stick to the basics of SEO, most of the time you won’t be needing many fancy tools. Google’s own, this is the only keyword research tool you will ever need. Find the most popular keywords in your niche, get the search volume and popularity of related keywords, and do much more. Perfect to find long-tail keywords! If you’re short on time, this tool is ideal to help you find the right keywords for Google and Bing quickly. Just put in a few words, and it will return with up to 750 keywords suggestions. It’s a simple tool from Google. It checks the speed of your website. Just enter the URL of your website and it will tell you how fast it loads on desktop and mobile. The best part is it returns with definite recommendations on how you can further boost the speed of your website. Also Read: Website speed and SEO- Does your site load in 2 seconds? It’s a keyword density checker. It gives you a list of words most frequently used across your website. The tool returns back with many one-word, two-word, and three-word phrases and the number of times they are used on your website. One of the cleanest and most resourceful website SEO score checkers. The tool analyzes different ends of your website (speed, keywords density, errors, header tags and more) and grades it accordingly. It returns back with suggestions to optimize your website even better for search engines. You can also compare your blog with competitors' and see who is better at SEO. Another great tool to check just how friendly is your blog to the search engines. The report is much more comprehensive. Aside from SEO, your website also gets scored on content, keywords, social media and few other technical parameters. Your blogging platform would likely have a ‘stats’ section, showing the number of views your posts/pages got, along with other insights. But if you want detailed traffic reports, Google Analytics is a go-to. It’s a very powerful web analytics tool (a bit complex to understand and use though). Using this, you can easily find more about your blog traffic and target audience (their demography, interest, age and more). And when you know these, you can effortlessly map a nice SEO and content strategy. Another one by Neil Patel, Ubersuggest is billed as "all-in-one SEO tool". It packs many features and too much data. You can use it to do keywords research, find content ideas and run competitor analysis. Ubersuggest, even with all its premium features, is a free SEO tool (with no hassle of even signing up). Like it or not, social media is an important component of a successful blogging journey. Whether to drive direct traffic to your blog, form a community of loyal fans or to engage your target audience with relevant contents—having a good social media following is crucial. One of the best social media management tools. Integrate various social profiles on a single platform to handle and monitor everything from Facebook and Twitter to Instagram and LinkedIn. It also offers the option to bulk-schedule your posts and has powerful analytics to optimize your campaigns. It is similar to Hootsuite, only with a slight difference in features and interface. On its centralized platform, you can integrate all your social media profiles. Monitor and manage everything from Facebook to Instagram, easily and quickly. It’s a Twitter-exclusive tool with a very clean dashboard to manage your Twitter profile much more conveniently and quickly. It’s popularly used to bulk-schedule tweets. There are few other social media marketing/management tools that are quite resourceful – like Social Clout, Followerwonk, MeetEdgar, and Sprout Social. Sadly, they come with hefty price tags. To that, I think unless you’re very (very) serious about social media marketing, Hootsuite or Buffer is more than adequate. As for analytics, today, social media networks have pretty solid built-in features to help you do that beyond sufficiency. Infographics and videos, too, have seen a massive surge in consumption across channels. If you want to leave a lasting impression on your audience, using beautiful visuals on social media platforms and on your website is very important. It is one of the most popular photo editing tools. It’s powerful and comes with plenty of awesome features. Aside from editing images, you can also make collages and create templates. This is my favorite tool to add texts on images. Much like PicMonkey, it comes with just as many features to redefine images and enhance them to the next level. It also has a collage maker and designer, which lets you work in layers. Whether for social media images, cover pictures, banners, logos, eBooks cover, ads or other marketing materials, Canva is as powerful as it gets. It comes with a plethora of pre-defined templates for all your visual needs. You don’t have to start anything from scratch. Just choose from its design options and create a beautiful image within minutes. A very easy-to-use logo making tool. Its interface is clean and simple. Plus, it comes with thousands of free graphics. So use these graphics, add beautiful texts and create a perfect logo that effectively defines your brand. Unsplash is my go-to for high-resolution, beautiful royalty-free photos. The website adds 10 amazing images every week. And today, it touts a collection of thousands of pictures of nearly every topic. Just hit the website and enter the kind of image you’re looking for. That’s it! It’s free and you don’t compulsorily have to give any credit to anyone. Pixabay is another great option to find high-quality free images that you can use – even for commercial purpose – without any permission. You don’t need to give credits to owners either. When you’re editing pictures and adding texts on images—does it not get confusing choosing a good color combination? If yes, use this tool! Just enter the hex code of your color or select any color from the palette, and Coolors will generate appropriate color schemes for you. It also has a Chrome extension. If you’re going to use this often, for higher convenience, add it in your browser. For a blogger, the significance of email marketing cannot be stressed more. You need a solid mailing list to turn your casual readers into dedicated fans and buying customers via. a well-designed sales funnel. Much like many, MailChimp is my favorite email marketing tool. The best part is it is absolutely free until 2,000 subscribers and 12,000 emails per month. It also offers opt-in forms. You can automate emails and run successful drip campaigns on the basis of various website, subscribers’ activities and other segmentation. When your mailing list grows and you need to push more emails, you can easily upgrade to a premium plan, which is quite cheap. Aweber is another very popular email marketing and automation tool. It packs highly powerful features, including drag-drop editor, countless HTML templates, auto-responders, and beautiful opt-in forms. The only downside is it costs. Even for the 30-days FREE TRIAL, you will have to provide them your credit card details. This is a free email tracking service. It notifies you when your emails get read by recipients, tells you how long it was read, tracks links in your emails and more. GetNotify is an ideal tool to learn about and optimize the content of your emails. Perfect for A/B testing. AddThis is popular for its social sharing buttons. However, it also offers a great list building tool to increase the number of your subscribers. You can add the form as popup, banner, and slider. Also, the simple Addthis integration with other email service providers (like MailChimp) makes things even more effortless. The tool is lightweight and works very smoothly on nearly every blogging platform. To that, it’s pretty easy to configure. You have to pay for this (it’s cheap though)—but it’s worth mentioning. A foremost choice of many bloggers, it’s a powerful tool to create popups and sliding subscription forms. OptinMonster comes with many ready-to-use themes and styles. Creating a new design with HTML, CSS is equally easy. The name gives it away. It’s an email extractor tool where you enter a URL or keyword and it crawls through several webpages, coming up with a list of all the email address that came on its way. It’s a perfect tool if you’re taking up influencer marketing. So you’ll have to ace the art of time management. You must be at your productive-best—doing things quickly and efficiently, doing more things in a small span. Trello is a rising hero for the bloggers and it’s as appealing as it gets. It’s a project management tool that also allows collaboration with other people. The interface is attractive and very simple. There’s drag-drop option, allows media attachments and it’s supported on both desktop and handheld devices. To be a successful blogger, you need consistency and discipline in your writing habit. You need an editorial calendar. And Google Calendar is the best free tool for this. Decide on your posting frequency, brainstorm blog post ideas, and fix dates when you’re going to post what. Schedule time when you’re going to actually write. Add descriptions and attach media files for more details about your ideas. While many people advice for Dropbox, I find Google Drive the right cloud-based storage tool for me. From emails to search, we’re hung up to Google’s services. So, for a more seamless experience and integration, Google Drive seems like a better choice. Store your files here and access it from anywhere and any device. Evernote is a very popular note-taking tool that works on desktops and smartphones. Install it on your devices to take, access and edit notes easily. Your write-ups are synced within your account, which you can open them at any place, from any device. It’s a very (very) simple tool that helps you with time management. It’s basically a timer for your browser. Just turn on the countdown and start working. You will never lose track of time. You will always know when you’re spending more time in a task than what you really should. Make your blog more powerful. Add to its functionality and enhance Users’ Experience seamlessly. These tools are universal (ideal regardless of the blogging platform you use) and are very popular. Note: While all of these are very resourceful, resist the temptation to use them all. It’s going to slow down your website. Hello Bar is much more than what its name suggests. Of course, its biggest USP is a box sticking at the very top. Using this you can collect visitors’ email address and navigate them to a different page. But it also offers plenty of other features. Using Hello Bar tool, you can grow your social media following much easily and also make important announcements to the visitors. It’s a social sharing button that everyone loves. Lightweight, easy to configure and with plenty more features, AddThis vouches to improve the functionality and engagement of your blog... for free. Aside from social sharing buttons, it also offers many other options, including list building, social following, and a tip jar. Disqus is possibly the most popular commenting system for blogs. And there are good reasons for that. It’s very easy to install, has a centralized platform to moderate all your comments and integrates well with all social platforms. Plus, it’s much more than just about comments. It’s a social platform in itself that strives to improve your engagement and build a loyal following. This tool made all sort of right noise when it landed in the mainstream—and it’s still quite popular. It packs many amazing features – some free, others premium – like list builder, push notification, social buttons, image sharer, and A/B testing. I have intentionally left out some common blogging “tools” like web hosting service providers, domain registrar, Skype, Dropbox, PayPal, Invoice software, Google Webmaster, LeadPages and WordPress plugins (like Yoast and Jetpack). And I am not sure why! Maybe they are too common, platform-specific, costly, depends on individual preference.